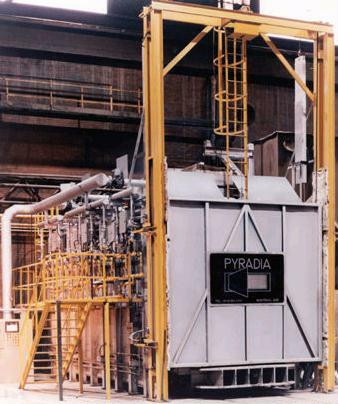 Batch Furnaces refer to the method of heat treating – one “Batch” at a time, and thus the general design of the furnace itself. A Batch Furnace varies is size from the small “hearth” style that resembles a small pizza oven, to large “car bottom” furnaces that are literally use railroad sized cars on rails to move product in and out of the furnace. 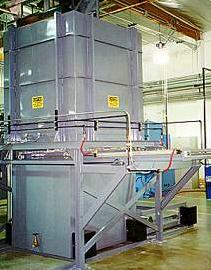 Vacuum and protective atmosphere furnaces are also most often batch furnaces. 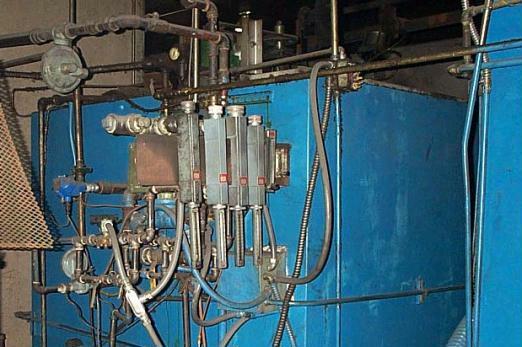 The most common and basic heat treat furnace is the Box Furnace. It is a highly insulated steel box with a door on one end and one or several gas burners. 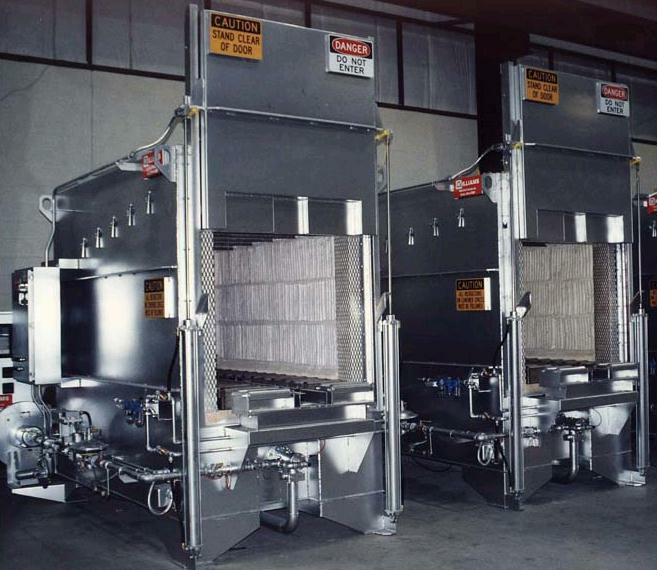 Box furnaces are rated according to their physical size (the bigger the box the bigger the parts that can be processed), the temperature rating (the higher the temperature, the wider the range of products) and the pounds per hour (productivity). Insulation may be fibrous (like blankets or mats) or rigid (like boards, slabs or bricks). Accuracy of temperature control is an issue in many processes, so better units will promote tighter temperature control. Without a shadow of a doubt far and away the most common unit is the Allcase line produced by Surface Combustion (by the way the 2 largest manufacturers are Surface and AFC and both produce the same size units). Taking it one step further the most common size is 30″ X 30″ X 48″. These furnaces new, sell for just under $300,000 US (all figures are US dollars). What’s it worth on the used market? Obviously the 2 main criteria for pricing are age and condition which generally (but not always) go hand in hand. Just like used cars the second it’s off the lot the price drops dramatically. Keep in mind this is partly because there are costs involved in removing a unit and moving it to a new location, also no warrantee. This “rigging” expense, although it varies is typically in the range of $2,500 to $7,500. In my experience a used batch IQ very seldom ever goes for more than half of the new value unless it is in immaculate condition and is a very recent model. This gives us a top end of $125K to $150K. Bottom end? I’ve seen $25K and even less for a shell. Price range we end up with is $25K for a very rough unit up to about $125K-150 with an average price (if there is such a thing) somewhere around $65,000 to $75,000 for a unit in operating condition but which would probably require a small amount of work. By the way if a unit needs all new alloy (tubes, fan, roller rails etc.) this will easily cost $10,000. Manufacturer does very much effect the price with Surface and AFC units (being the most common) at the top of the scale and everybody else a little further down. By the way in very hot demand these days are the larger units such as 36″ X 48″ X 36″. Unfortunately these very seldom come on the market these days. 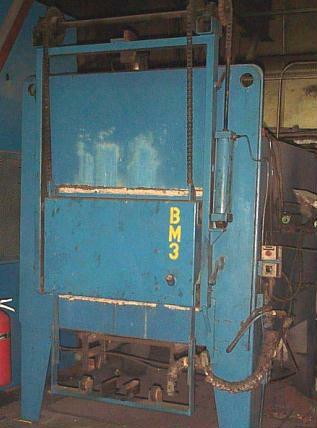 The largest of the batch furnaces are called “car bottoms”. Notice in the picture to the right that the structure below the door is the end of a “car” or rail road like unit on tracks that moves in and out of the furnace with the load. Then an overhead crane can move the load to and from the car bottom. 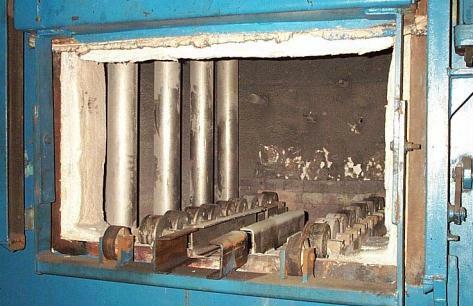 Car bottom furnaces can take days to complete a single load cycle. Pit Furnaces may or may not actually be installed in “pits” but the load is always vertical. They range in size from about 6 feet that stand on a floor, to over 40 feet that penetrate deep into the ground. Note that the load must be put in and taken out from over-head equipment. So a 40 foot load must have a 40+ foot crane, etc. The same kinds of processes are completed in pit furnaces as any other kind of batch furnace, but the loads are very sensitive to flexing or bending stresses so they must be held vertically. Vacuum furnaces are a special kind of controlled atmosphere furnace. 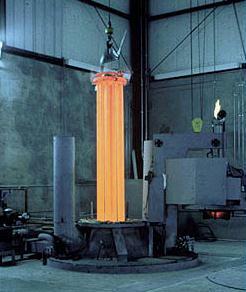 The parts produced in vacuum furnaces are highly critical to the atmosphere they are exposed to when heated, so the atmosphere in the furnace is first removed – a near vacuum is created, and then in some cases the process continues in the ‘vacuum’ or a small amount of very pure gas is injected. In the past, vacuum furnaces were only available in electric. Work over several years by the gas industry has resulted in a several gas models, but they are still restricted in temperature range, as compared to the electric versions. Therefore, electric still dominates this sector. Heat Treat Furnaces operate at very high temperatures, making them excellent candidates for heat recovery applications. The most common method of heat recovery is the Regenerative Burner. Regenerative Burners have a system that captures their own flue gas to heat a mass that in turn heats combustion air coming into the burner. If a heat treat furnace is running at say 1,900F and the combustion air can be preheated to say 1,000F, that represents a LOT of BTUs saved.